An oldie but a goodie - Roasted Lamb is a protein that is traditionally eaten at this time of year. But yes, we are all busy so what's the easy way to do this? Because, like everybody, I like my long weekend cooking to be totally stress-free! I have used one of my favourite Jamie Oliver recipes that fills your kitchen with an amazing aroma, and when you accompany it with roasted veggies, it makes a fuss-free, delicious meal that will be loved by all the family. Roast Lamb is fantastic with mint jelly, and as you can see from the recipe - it really is all you need. So your table is set, get your food preparation done before your guests arrive, get your the veggies ready for roasting, season your roast and pop it all in the oven. Then spend the rest of your time with your family and friends, because that is what Easter is all about. 1. One hour before you are ready to cook, take the lamb out of the fridge and allow to come up to room temperature. Preheat the oven to 190c. 2. Fully slice off the severed top piece of the lamb leg (if attached) and set aside. With a small sharp knife, pierce the lamb about 12 to 14 times all over. Aim to make the cuts about 5cm deep and at an angle, then poke your finger into each cut to create room. Pick the rosemary leaves, slice the chilli into ½ cm slices and peel and finely slice the garlic. Stuff some rosemary leaves, a slice of chilli and a slice of garlic into each cut and rub the lamb all over with oil. Squeeze over the juice of ½ a lemon and season generously with sea salt and black pepper. 3. Place the lamb in the preheated oven directly on the bars of the middle shelf with a roasting tray underneath to catch the juices. Cook the lamb for 30 minutes per kilo for nice, pink lamb. Cook little longer if you prefer yours less pink. 4. To make the gravy trivet, roughly chop the carrots and trim and roughly chop the celery. Peel and cut the onions into wedges. Strip over the thyme and rosemary leaves and add the bay leaves. Forty minutes before the lamb is cooked, remove the tray from the oven and add the veg and herbs, quickly toss in the juices and place back in the oven underneath the lamb – this will help make the most delicious gravy. When the lamb is cooked to your liking, remove from the oven, loosely cover with tin foil and leave to rest. 5. Place the roasting tray on the stove over a medium heat, then use a potato masher to really mash and break everything down. Keep mashing and scraping all the goodness from the bottom of the pan, then gradually mix in the flour to thicken it up. Pour in the wine and let it bubble away before adding one litre of boiling water, stirring continuously to get a smooth gravy. Bring to the boil, then gently simmer for 15 minutes, or until thickened. Carefully sieve the gravy into a jug, pushing all the goodness through with the back of a spoon, then stir in the jam. This will give a delicious sweetness and make the gravy nice and glossy. 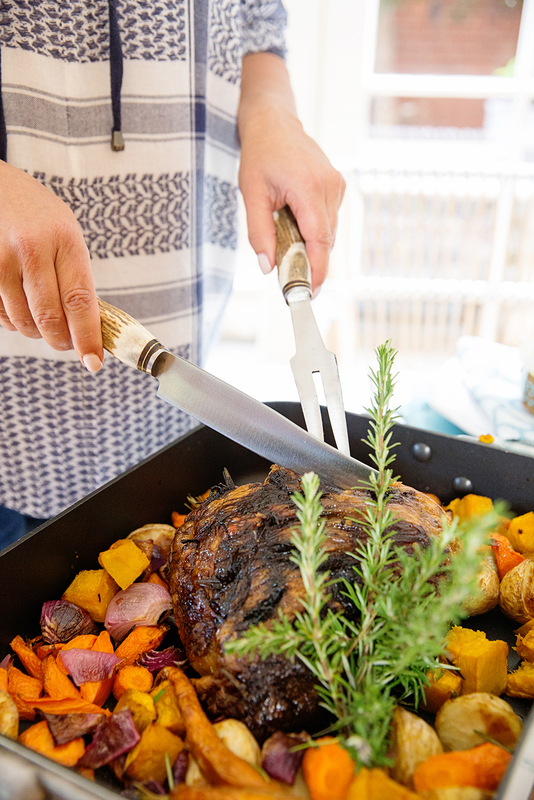 Carve up the lamb and serve with the gravy and some lovely seasonal vegetables – enjoy! Cut apples into thick slices but do not peel or core. Combine apples, water, lemon juice and two cups mint leaves in a large saucepan, bring to boil and cook for 10 minutes until apples are soft. Strain mixture through a muslin-lined sieve, over a bowl and stand overnight. Measure strained juice and return to a large, clean saucepan. Add one cup of sugar for each cup of juice and stir over heat until sugar is dissolved. Bring to boil and boil rapidly for 15 minutes or until setting point is reached. Add a few drops of food colouring to give desired colour. Remove from heat and add chopped mint leaves. Allow to stand for 10 minutes and stir the mint through to disperse evenly. Pour into sterilised jars.